Through close analysis of two scenes from 'The Sixth Sense', discuss how the director makes the audience believe that Dr Crowe is alive. 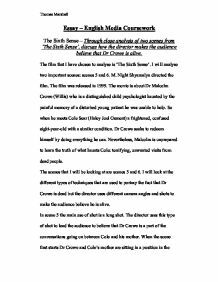 Essay - English Media Coursework The Sixth Sense - Through close analysis of two scenes from 'The Sixth Sense', discuss how the director makes the audience believe that Dr Crowe is alive. The film that I have chosen to analyse is 'The Sixth Sense'. I will analyse two important scenes: scenes 5 and 6. M. Night Shyamalyn directed the film. The film was released in 1999. 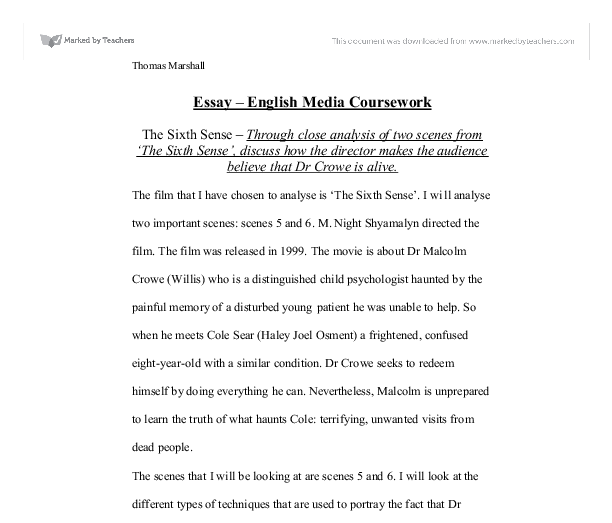 The movie is about Dr Malcolm Crowe (Willis) who is a distinguished child psychologist haunted by the painful memory of a disturbed young patient he was unable to help. So when he meets Cole Sear (Haley Joel Osment) a frightened, confused eight-year-old with a similar condition. Dr Crowe seeks to redeem himself by doing everything he can. Nevertheless, Malcolm is unprepared to learn the truth of what haunts Cole: terrifying, unwanted visits from dead people. The scenes that I will be looking at are scenes 5 and 6. I will look at the different types of techniques that are used to portray the fact that Dr Crowe is dead but the director uses different camera angles and shots to make the audience believe he is alive. In scene 5 the main use of shot is a long shot. The director uses this type of shot to lead the audience to believe that Dr Crowe is a part of the conversations going on between Cole and his mother. ...read more. But Dr Crowe starts to get some questions wrong and the doubt that started to build within the audiences' thoughts start to recede. The way in which the camera shots are used then makes the audience ponder whether Dr Crowe could be alive or not. When Dr Crowe asks Cole the questions, the cameras cross cuts from Cole's face, to his feet, then to Dr Crowe's face. When you see Cole start to move backwards the facial expression on Dr Crowe's face shows that he is failing and then the audience then begins to re-believe Dr Crowe is alive. The directors use of these type of camera shots and facial expressions makes the audience want to continuing watching to find out if Dr Crowe is alive. The way is which the director makes you think Dr Crowe is alive then isn't is a sneaky way of building the dramatic irony in the scene making the audience want to watch on further. In scene 6 the main use of camera shot is again, long shot, but this time the zooming comes into place. The director uses these different aspects to make the audience believe that Dr Crowe is alive. When the scene begins, we see Dr Crowe's wife sitting in a posh restaurant on her own. We can feel the intensity about to happen because of the atmosphere of the restaurant and the body language of Dr Crowe's wife. ...read more. In conclusion I feel that the director has successfully and easily mislead the audience into thinking that Dr Crowe was alive. He left clues for the audience to pick up on but hid them with clever manipulation of camera angles and shots and the way the actors played their characters. In scene 5 he made it obvious to the audience that Dr Crowe was alive because of the way he set Dr Crowe and Cole's mother out at the beginning. Also when Cole's mother looks at Dr Crowe at the end of her conversation with Cole was a brilliant way of misguiding the audience into thinking she was talking to him and that he was alive. In scene 6 the way the director moves the camera angles makes you think that Dr Crowe's wife is annoyed with him, when actually she isn't aware that he's there. When she says 'Happy Anniversary' it makes the audience believe it's a sly dig at Dr Crowe's late showing and the quick glance makes the audience believe that Dr Crowe is alive. What I find striking is that you only ever see Cole talking back to Dr Crowe. He is the only character in the whole movie to talk to Dr Crowe directly and Cole is the only one to listen and respond to his comments. The director hides this extremely well into fooling the audience and is a brilliant way of making the film a truly great watch. Thomas Marshall ...read more. Another dramatic moment was when Willy tells his boys: "I was fired today". This is not a surprise to the audience, as we knew it would come; however when it came comes as a shock. It is abrupt and early on into the scene. Bruce Willis was specifically chosen to play the role of Dr. Malcolm Crowe. This is not a role that the audience would expect to see Bruce Willis in as he has been mainly defined as an actor in action films e.g. The music throughout this section is deep and harrowing. The music is in the minor key, making it sound ominous and threatening. The director has also used a quiet crescendo to create suspense. Throughout this sequence, Derek says very little, only a few words. This also leads the audience to believe that he is shy and unable to stand up for himself, generating yet more sympathy for him. This technique is a good one to show that Dr Crowe is alive when he is not. Then she lifts her head up but we cannot see her face, she then moves it despondently to the side, this makes the audience think- is she ignoring him for being late? When Hooper and Brody go out on the boat at night, the dark atmosphere makes the scene seem scary, and the audience is tense. When Hooper dives into the water, he says that he will be back soon. The audience think that he won't be back soon and he would be dead. The dramatic music has begun and we see the view through the shark's eyes. The audience sees the legs of other people. The music gets faster and faster and much more dramatic, from this point the audience knows what the shark is after. Every time somebody walked across the camera, zooming was used on Brody. This was to show that he is getting worried about something. The tension started to build at this point. It gives the audience a feeling that the offence that was meant to happen is getting closer.